Pretty magnet - from my sisters and their umpteenth visit earlier this month. 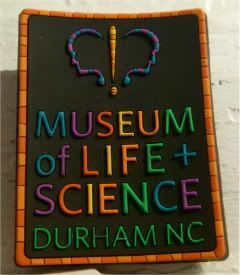 I can't tell you the number of times I've been to Durham, NC, but zero is the number of times I've been to the Museum of Life & Science. The weird part is, I know lots of people who love the place and who go there all the time, so I don't know how it is no one's actually brought me here. Of course, I do have this theory that people are either art museum people or life science/natural history museum people. Clearly, if you've read any page of this blog, ya'll know I'm the former. For example, a good friend of mine from Long Island, who lived on the Upper East Side had never been to the Met until last week - ever. I mean, she lived right down the street from it. On the flip side, she's been to the Museum of Natural History on the opposite side of the park a million times and loves it there. Absolutely no judgment, it's just an observation that backs up the whole different strokes for different folks to rule the world school of thought. The sad of it is, today, I should have definitely headed over to the Museum of Natural History to see their presentation with their Carl Zeiss Vision telescope to see this year's last Manhattanenge, where the sun sets directly down the major cross-streets of Manhattan. It's an amazing sight from what I've seen from the pictures, and of course now I have to wait until next year. Even though I'm totally convinced that that Manhattanenge is just this big PR stunt to make folks visit, sponsored by science/nature/City of New York. Seriously, up until four or five years ago, no one had ever heard of it. Now it's like a ritual celebration!